This summer Mr. Bailey and I upped our travel quotient by triple from last summer, when our big trip was a long weekend camping excursion in the high country. As a family, we were focused on making fresh, fun memories to blow the stink out of the sadness-soaked highlights of the last two years. 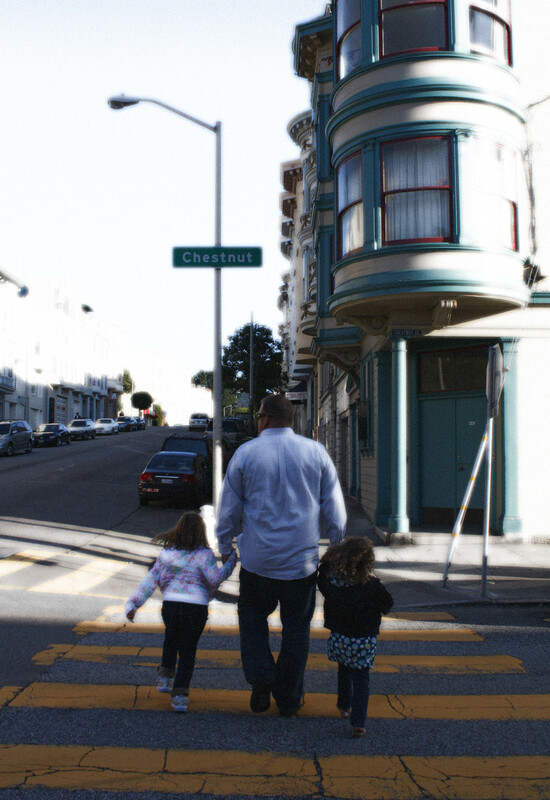 Our first trip took us to the Bay Area, always a go-to place for The Baileys pre-kid days. Now that Prima and Secondo are 8 and 4, we figured it was the first trip they had a chance at remembering. We budgeted to stay in the city, strategized about visiting some touristy San Fran spots, and planned to stroll, eat great meals, and createGolden Gatememories for our family. About halfway through, as we rendezvoused with my brother who lives in the Bay, we were treated to a rapid-fire re-accounting of all the glorious highlights of our vacation so far – kid style. “So, Uncle Benny, first, my Mom left her Nook on the airplane,” Prima began in her know-it-all-voice. I groaned. No, no, no, these weren’t the memories I expected! “Yeah, yeah, yeah, Uncle Beeny, and we were on the train and she said, ‘Oh no, I forgot my Nook!’ And she started to cry,” Secondo chimes in, her voice going up an octave in excited urgency. Oh, shoot, I thought, my forgetfulness is now the highlight of the trip. “And then, Uncle Benny, we were walking along and we saw the Sparkle Guy!” Prima shouted, cutting off her sister. 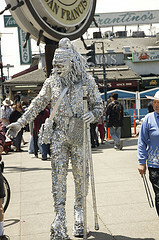 The Sparkle Guy is aSan Franciscoperformance artist/walking tourist trap who hangs out on the Pier clad in silver glitter from head to toe. “But, but, but, then Uncle Beeny, later we saw him and we were walking to our hotel, and it was later, and, and – ” Secondo’s words couldn’t come fast enough. “Prima,” I moaned, having forgotten that part of the trip entirely. Sure that was funny at the time, but really? I thought. “Then!” Prima battled back, “We were at the Pier and this girl made this old guy take her picture and he took off his gloves really slowly and took the picture and gave back the camera and then she looked at the picture and said, ‘Can you take it again? My hair was in my face!’” both girls laughed wildly. OK, that was hilarious, I allowed. Their uncle told them how impressed he was with their stories. It was silent for a moment or two as I recalibrated my expectations of what this trip would bring into their sweet little minds. But I couldn’t give up without a fight. Mr. Bailey, my brother and I burst out laughing. Despite the months of planning, the savings account expense, the sacrifice on the part of my brother and his family to host us, and our focus on seeing the sights and making halcyon memories, the kid-version highlights boiled it all down to a mish-mash of discarded, humbling moments. At first it was discouraging. But then, it was delightful. The kid-version, I realized, made hay out of chance encounters, stressful moments, mishaps and entertaining misfits. It cast bit players in starring roles and illustrated the humbling humanity in the parents they probably too often see as perfect. Once I re-jiggered my thoughts, I was elated by the kid-version highlights, and asked the girls to recount them again and again. I laughed at their tales, rich with a child’s perspective, free of any pretense and goofily making dramas out of silly moments the four of us had shared. 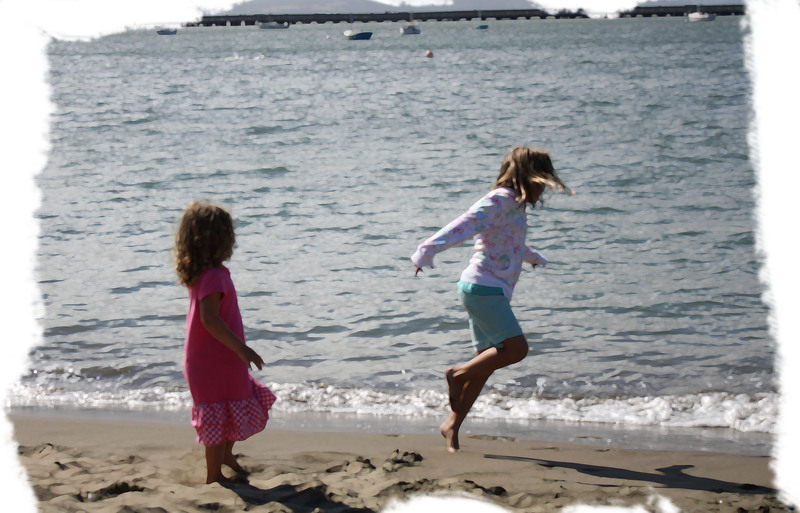 Posted in Main and tagged Bay Area, child, children, Fisherman's Wharf, humor, insights, kids, modern mary, motherhood, mothering, parenthood, parenting, San Francisco, travel, travel with children. Bookmark the permalink. Are You A Not Enough Time Person? Simply provide your email address to subscribe to Modern George & Mary and receive notifications of new posts through email. Sweet words can sometimes sting!